The Monacelli Press, 9781580934718, 480pp. Architectural photographer Richard Pare is the author of the seminal The Lost Vanguard: Russian Modernist Architecture 1922-1932 (The Monacelli Press, 2007). He was the founding curator of the photography collection of the Canadian Centre for Architecture and a consultant to the collection since 1989. He is represented in many major public collections of photography. Jean-Louis Cohen is founder of the Cité de l'architecture, a museum, research, and exhibition center in Paris's Palais de Chaillot. His research activity has been chiefly focused on twentieth-century architecture and urban planning. He has studied German and Soviet architectural cultures in particular, and extensively interpreted Le Corbusier's work and Paris planning history. Cohen is the author and curator of many architecture books and exhibitions. "Pare traveled the world photographing the buildings of master architect Le Corbusier. 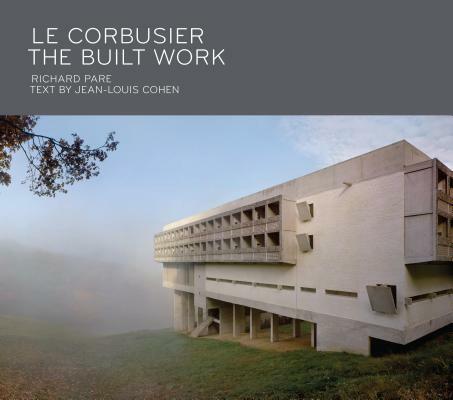 This book collects photos of Le Corbusier’s villas in Switzerland, his visual art center at Harvard University, and his multiplex structures in Chandigarh, India, and more." "The 20th century was one of the more divisive eras in architectural history, with pioneers like Frank Lloyd Wright, Ludwig Mies van der Rohe, and Walter Gropius paving the way for modernism—sometimes to the distaste of critics and the public. But perhaps no architect was as controversial during that era as Le Corbusier, today beloved and respected by architecture buffs around the world.... Today, the polarizing figure is the subject of a new book Le Corbusier: The Built Work, a photographic survey by Richard Pare of nearly the entire oeuvre of the architect reflecting the current state of his buildings." "Even the most fanatical Le Corbusier devotee will likely encounter a project—of cavernous concrete, brightly-painted plaster, or towering glass walls—that they haven’t yet seen." Pare's "work is skillful, characterful, and generous in quantity... You have seen these buildings and their interiors before, but you've never seen them quite like this."